The maxillary sinus is a pyramidal cavity, the base of which lies lateral to the nasal cavity. In adults, the dimensions of the sinus are approximately 33 mm in height, 23-25 mm in width, and 34 mm in the anteroposterior axis; the volume is approximately 15 mL. Maxillary sinus size may be asymmetrical within the same individual. Surgical treatment of acute maxillary sinusitis. The left orbital subperiosteal abscess is displacing the medial rectus muscle. Another indication for sinus puncture is to provide culture material to guide antibiotic selection when empiric therapy has failed or when antibiotic choices are limited. This is particularly important in patients who are immunocompromised or under intensive care, in whom sinusitis can be a prominent source of sepsis. 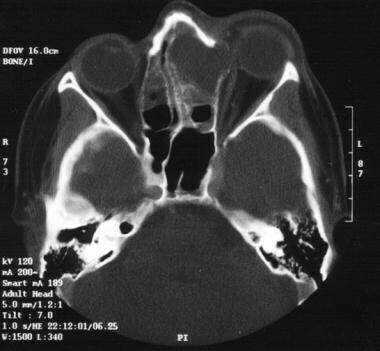 Preoperative imaging is necessary to document the presence of acute sinusitis and to guide surgical planning. Conversely, frontoethmoidal and sphenoethmoidal mucoceles tend to be symptomatic and have a high potential for bony erosion. Frontoethmoidal mucoceles should be completely removed and the sinus obliterated. Sphenoethmoidal mucoceles should be widely opened into the nasal cavity. An ethmoidal mucocele appears in the image below. Surgical treatment of acute maxillary sinusitis. The left ethmoidal mucocele is complicating chronic sinusitis: note the proptosis of the left eye. Surgical drainage of the infected sinuses and the orbit is advocated for Chandler classifications III-V if orbital cellulitis progresses or fails to improve despite medical therapy or if loss of visual acuity occurs. Schlemmer and Naidoo (2013) published a retrospective study from South Africa on complicated sinusitis. They described 138 patients with orbital complications only and 82 with intracranial complications. A high index of suspicion must be maintained in detecting intracranial extension of the disease. Appropriate referral for management prevents high rates of morbidity and mortality. Management of intracranial complications of sinusitis is surgical—drainage of the affected sinus and the cranial abscess. Al-Radadi and Alnoury (2011) reported on a patient with optic chiasma compression. This is a very rare complication of allergic fungal rhinosinusitis. Immediate medical and surgical management is important. Sinus puncture in adults can usually be achieved using local anesthesia; in children, however, a general anesthetic is usually necessary. Several techniques have been described for drainage of the maxillary sinus. The inferior meatus and canine fossae are optimal drainage sites because of their ease of accessibility and relatively thin, well-vascularized bone. Place conscious patients in the sitting position to allow for drainage of the sinus contents into a provided basin. Protect the airway and suction the oropharynx during sinus puncture performed on unconscious patients. In patients in the intensive care unit, catheterization of the sinus may be undertaken with puncture to ensure continued adequate drainage. Use topical anesthesia (eg, cocaine, tetracaine, lidocaine 4%) and a local anesthetic/vasoconstrictor (eg, lidocaine 1% with epinephrine 1:100,000) to infiltrate the inferior meatal mucosa. Placement of a curved trocar through the mucosa and bone 1 cm above the floor of the nose, one third of the way toward the posterior choana with an upward angle, allows for optimal penetration of the sinus. A curved trocar is preferred to the straight type to minimize risk of orbital injury caused by misdirected force. Advance the trocar until the sinus mucosa is penetrated, then remove the introducer. Aspirate a sterile sample with a 10-mL syringe for Gram stain, culture, and sensitivities. Irrigation of the sinus with 50-100 mL of isotonic sodium chloride solution allows flow of purulent secretions through the natural ostium. Irrigation should commence only after the position of the trocar is confirmed to be in the antrum by aspiration of air or purulent fluid. The procedure is complete when secretions passing through the natural ostium are clear. Remove the trocar and have the patient rest for 15 minutes to prevent vasovagal episodes. Use topical anesthesia (eg, cocaine, tetracaine, lidocaine 4%) and a local anesthetic/vasoconstrictor (eg, lidocaine 1% with epinephrine 1:100,000) to infiltrate the superior gingivolabial groove at the level of the canine fossa. Placement of a straight trocar through the mucosa and bone superior to the root of the canine tooth, inferior to the infraorbital foramen, medial to the zygomatic buttress, and lateral to the piriform aperture, allows for optimal penetration of the sinus. Advance the trocar until the sinus mucosa is penetrated, and then remove the introducer. Irrigate the sinus with 50-100 mL of isotonic sodium chloride solution, which allows flow of purulent secretions through the natural ostium. Irrigation should commence only after the position of the trocar is confirmed to be in the antrum by aspiration of air or purulent fluid. The procedure is complete when the secretions passing through the natural ostium are clear. Remove the trocar and have the patient rest for 15 minutes to prevent vasovagal episodes. Endoscopic techniques of sinus drainage may be useful if multiple sinuses are infected or to decompress the orbit in patients with complications. Using a 0° or 30° telescope, the nasal cavities are inspected bilaterally. The condition of the mucosa, turbinates, septum, and airway are noted, as is the presence of purulent secretions. On the side of the maxillary sinus infection, the middle turbinate and uncinate process are infiltrated with 1-2% lidocaine with 1:100,000 epinephrine. The nose is then packed with 0.25-inch gauze for 5 minutes, allowing time for optimal decongestion. Using a freer elevator or a backbiting instrument, the uncinate process is removed, exposing the maxillary sinus ostium. The maxillary sinus is entered using a curved suction, and secretions are sent for culture. The ostium is opened widely to allow for optimal sinus drainage. If the patient has concurrent ethmoid disease, an ethmoidectomy is performed. No absolute contraindications for maxillary sinus drainage exist; however, prudent evaluation is necessary in patients at high risk of bleeding (eg, low platelet count) or with anatomic variations that increase the risk of injury to adjacent structures (eg, hypoplastic maxillary sinus). Complications of nonendoscopic drainage procedures can be minor or severe. The most common complication is failure to enter the sinus because of improper positioning of the trocar, incomplete penetration of the sinus mucosa, or the presence of a hypoplastic antrum. Epistaxis may occur because of laceration of the nasal mucosa or preexisting coagulopathies necessitating packing. Severe complications include orbital injury, air embolism, and death secondary to injection of air into the sinus. Tomomatsu N, Uzawa N, Aragaki T, Harada K. Aperture width of the osteomeatal complex as a predictor of successful treatment of odontogenic maxillary sinusitis. Int J Oral Maxillofac Surg. 2014 Nov. 43 (11):1386-90. [Medline]. Rosenfeld RM, Andes D, Bhattacharyya N, Cheung D, Eisenberg S, Ganiats TG, et al. Clinical practice guideline: adult sinusitis. Otolaryngol Head Neck Surg. 2007 Sep. 137(3 Suppl):S1-31. [Medline]. Conrad DA, Jenson HB. Management of acute bacterial rhinosinusitis. Curr Opin Pediatr. 2002 Feb. 14(1):86-90. [Medline]. Sultész M, Csákányi Z, Majoros T, Farkas Z, Katona G. Acute bacterial rhinosinusitis and its complications in our pediatric otolaryngological department between 1997 and 2006. Int J Pediatr Otorhinolaryngol. 2009 Nov. 73(11):1507-12. [Medline]. Simuntis R, Kubilius R, Vaitkus S. Odontogenic maxillary sinusitis: a review. Stomatologija. 2014. 16 (2):39-43. [Medline]. Bailey J, Change J. Am Fam Physician. Antibiotics for acute maxillary sinusitis. May 1 2009. 79(9):757-8. Troeltzsch M, Pache C, Troeltzsch M, et al. Etiology and clinical characteristics of symptomatic unilateral maxillary sinusitis: A review of 174 cases. J Craniomaxillofac Surg. 2015 Jul 29. [Medline]. McCarty JL, David RM, Lensing SY, et al. Root Cause Analysis: An Examination of Odontogenic Origins of Acute Maxillary Sinusitis in Both Immunocompetent & Immunocompromised Patients. J Comput Assist Tomogr. 2017 May/Jun. 41 (3):484-8. [Medline]. Giotakis EI, Weber RK. 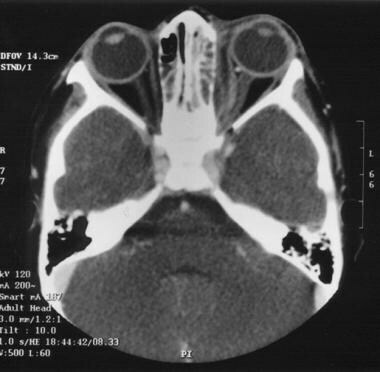 Cysts of the maxillary sinus: a literature review. Int Forum Allergy Rhinol. 2013 May 15. [Medline]. Schlemmer KD, Naidoo SK. Complicated sinusitis in a developing country, a retrospective review. Int J Pediatr Otorhinolaryngol. 2013 May 17. [Medline]. Al-Radadi AM, Alnoury KI. Optic chiasma involvement secondary to allergic fungal rhinosinusitis. J Pak Med Assoc. 2011 Jul. 61(7):704-7. [Medline].